Blue Sky Guttering Ltd clean all types of residential and commercial guttering in Leicester & East Midlands. Are your gutters clogged, loose, cracked or broken in Leicester & East Midlands? Degraded or missing guttering causes serious damage to your home. Blue Sky Guttering will repair your guttering and include our no quibble guarantee on all our work. Blue Sky Guttering Ltd clean and repair all types of residential guttering in Leicester & East Midlands. Our services include Gutter Lining and all our services are 100% Guaranteed. Gutter cleaning, gutter repair and gutter lining services for your house, school, shop, businesses, offices, industrial unit, hotel, hospital, apartment and much much more. Blue Sky Guttering offer gutter cleaning services in and around Leicester & East Midlands. We pride ourselves on being a small team focused on customer service and have built and maintain a strong reputation among a growing number of residential and commercial customers based on safety, trust, service, quality and competitively priced work. From the information you supply we can give residential customers an instant and accurate fixed price for gutter cleaning and gutter repairs by email. Our charges are very competitive and offer exceptional value for money. The price you are quoted is the price you will pay, there are no other hidden charges. Blue Sky Guttering Ltd repair all types of residential and commercial guttering. We provide gutter repair services for your home, school, shop, business, office, industrial unit, hotel, hospital, apartment and much much more. We are dedicated to provide a professional, safe, environmentally friendly, high quality and cost effective service to every customer. Blue Sky Guttering Ltd clean and repair and line all types of commercial guttering in Leicester and all areas in the South East and Home counties. 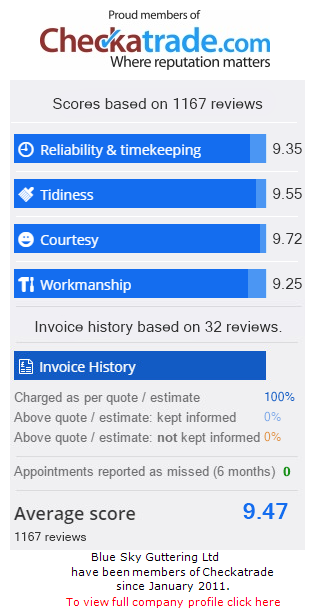 We have been Checkatrade members since January 2011 and have received over 700 customer feedback reports with an average score of 9.8 out of 10. Health and Safety is an important aspect of all businesses and we work closely with our consultants at H & S Direct - we make sure all of our health and safety procedures and training records are in place, completed and updated on a regular basis. Our client`s have complete peace of mind when choosing Blue Sky Gutters. Copyright © 2015- 2019 All Rights Reserved Blue Sky Guttering Leicester.